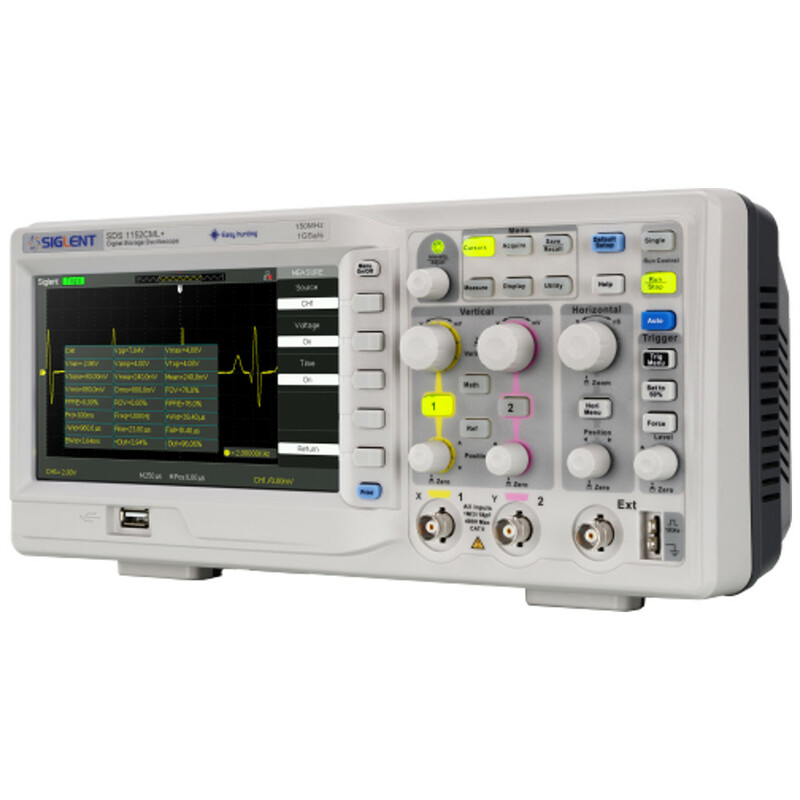 The SDS1072CML+ is a dual-channel 70 MHz universal digital oscilloscope. It includes a 2 Mpts memory depth that helps to ensure accurate waveform resolution and to capture longer signal lengths. With its 7 inch TFT-LCD (800*480) screen, there is adequate screen space to help better see and analyze waveform details. Along with a 1 GSa/s sampling rate, the SDS1072CML+ supports 32 parameters measurements and common mathematical operations to speed up complex / repetitive measurements. Real-time sampling rate up to 1 GSa/s, Equivalent-time sampling rate up to 50 GSa/s. Memory Depth up to 2 Mpts. Trigger types: Edge, Pulse, Video, Slope, Alternate. Waveform math functions:+, -, *, /, FFT. Supports Multi-language display and embedded online help. Screensaver from 1 minute to 5 hours. Digital filter and waveform recorder function. 7 inch TFT-LCD display with 800 * 480 resolution. Multiple interfaces: USB Host, USB Device (USBTMC), LAN (VXI- 11), Pass / Fail.